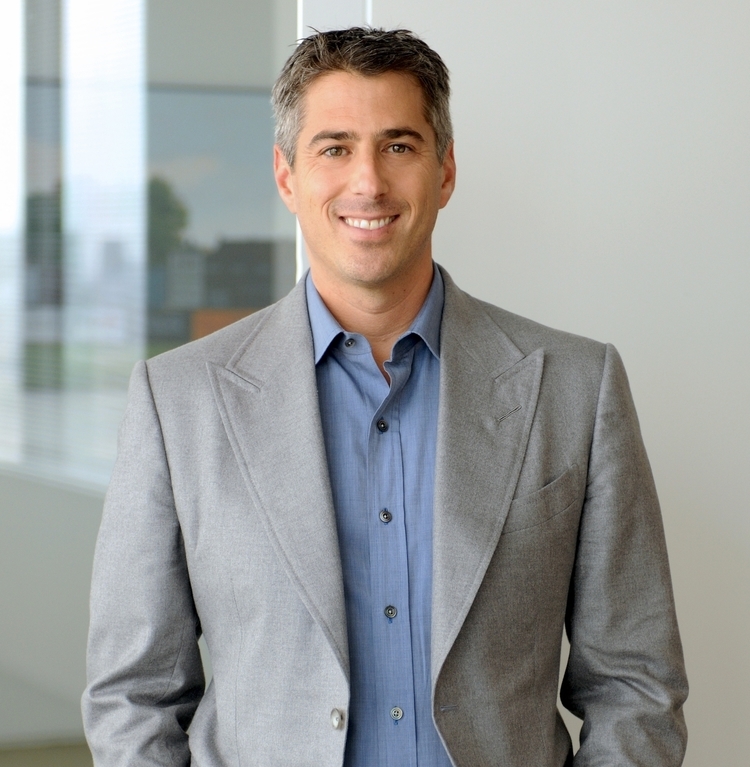 Personality among the most influential in California in the sports field, Casey Wasserman is also a prominent figure in the education, health and culture sectors, but also in entertainment by leading the Wasserman Foundation and the « Wasserman Media Group ». 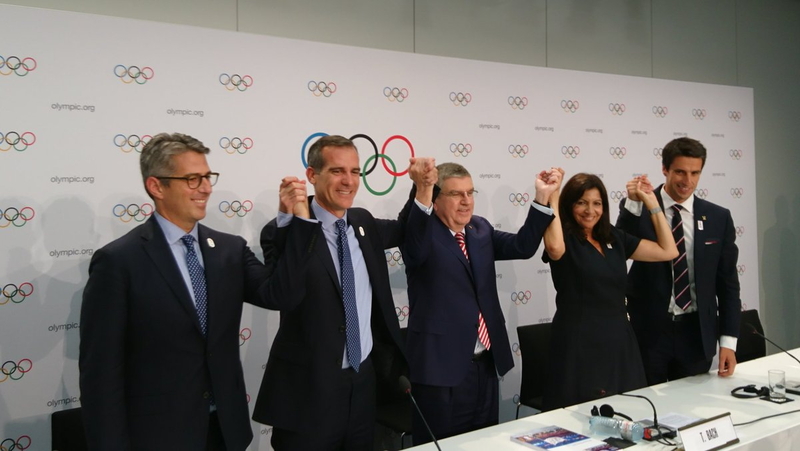 President of the Los Angeles Bid Committee for the Olympic Games, Casey Wasserman has responded exclusively to the questions of « Sport & Society » and this, one week after the formalization of an agreement in principle with the International Olympic Committee (IOC) on the Olympiad 2028. You are a key player in the sport in California and especially in Los Angeles. How were you convinced and how did you manage to mobilize around you for an Olympic bid ? It didn’t take much convincing when Mayor Garcetti asked me to lead the charge to bring the Games back to LA. First of all, I had an extremely positive experience at the 1984 Games, which I attended as a 10-year-old. I saw firsthand the power of the Games to unite our city, and inspire a love of sport in an entire generation. Second, I truly believe LA is a great Olympic city. From our wealth of existing, world-class sports infrastructure to our ideal climate for Olympic and Paralympic sport to Angelenos’ passion for live sport, we are a city that loves the Games and that is ready to serve the Olympic and Paralympic Movements. Last Monday (July, 31), Los Angeles has indicated that she was a candidate for the 2028 Games What is your feeling, just days after this announcement ? Monday was a historic day for Los Angeles, for the United States and for the Olympic and Paralympic Movements. We took a major step toward bringing the Games back to our city for the first time in a generation. As a bid committee, we are thankful to the IOC for its courage and vision in creating this unprecedented dual award. The ratification of a tripartite agreement will take place on September 13 in Lima. What are the next important steps for the bid, especially at the local level ? The LA City Council and US Olympic Committee will need to review and approve the new bid. LA 2028 will also continue engaging with Angelenos at community events in coming weeks. However, enthusiasm for a LA 2028 Games remains high, as a poll released last week by Loyola Marymount University showed that 83% of Angelenos support hosting the Games in 2028. The IOC will contribute more than $ 1.8 billion to the 2020 OCOG. How can you describe the opportunities offered by the 2028 Games : legacy, youth, marketing, etc. On top of the baseline IOC’s $1.8 billion contribution to the OCOG, there will be an additional IOC contribution of at least $200 million as a result of the estimated increase in TOP sponsorships. That would bring the IOC’s overall contribution to at least $2 billion, further reinforcing our ability to deliver low-risk Games. In terms of opportunities we can create through the Games, we have always been convinced that the Games would benefit our city tremendously, from inspiring future athletes to uniting our communities. After all, we saw this happen in 1984 with the establishment of the LA84 Foundation, which has benefited more than 3 million young Angelenos since its foundation in 1985. This agreement with the IOC allows us to deliver a legacy even before the Games begin. This agreement empowers our city to fund youth sports programs and lift up every community in Los Angeles– not in 11 years’ time, but in the years leading up to the Games. By making youth sports more affordable and accessible than ever before, we will be making an important step towards making LA the healthiest city in America. With 97% of existing or temporary sites, the Los Angeles bid has one of the highest rates of infrastructure ever registered by a Candidate City. So what are the priorities of the Organizing Committee for the next 11 years ? 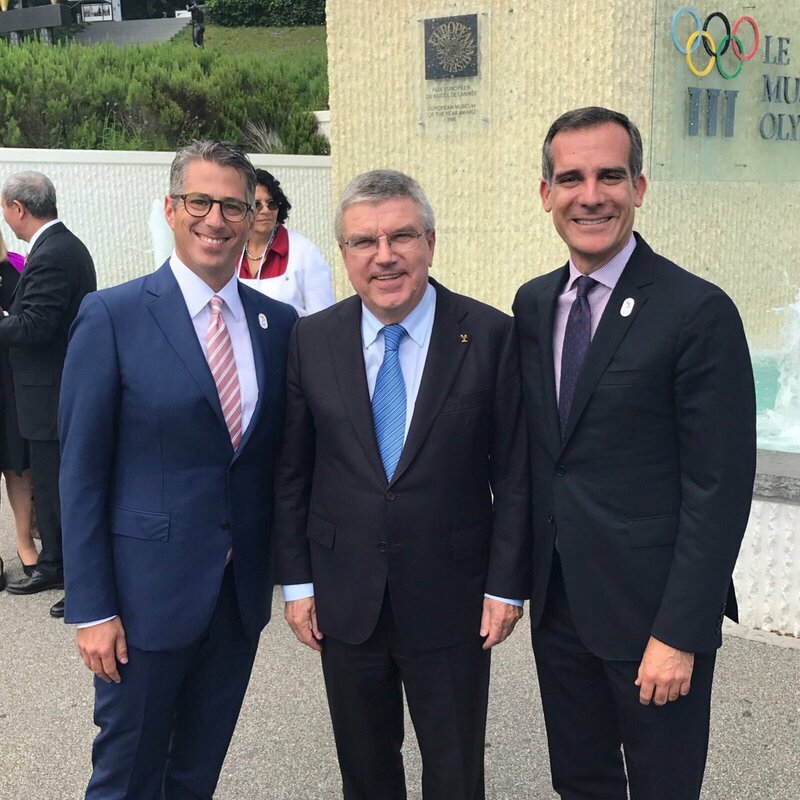 Broadly, Los Angeles will help ensure that the Games are sustainable and relevant for future generations, with the IOC’s Olympic Agenda 2020 reforms as our guiding principle, a ’no-surprises’ Games plan and the enthusiastic support of the people of LA. How can Los Angeles become a safe partner for the Olympic Movement today and tomorrow ? With zero new permanent construction required, including an existing, world-class Olympic and Paralympic Village at UCLA, LA 2028 offers the Olympic and Paralympic Movement a no-surprises Games Plan. The Games Plan you see today is the Games we will deliver in 2028. After two years as head of the Los Angeles Candidature Committee, how do you view the past campaign and the dialogue with the IOC ? It has been wonderful to work closely with the IOC to develop the best possible Games Plan that is ready to serve the Olympic and Paralympic Movements for generations to come. The new collaborative candidature process proved critical to ensuring our offering to the IOC was totally in line with the Agenda 2020 principles of minimizing risk and maximizing sustainability. It has also been an honor to compete and get to know some truly formidably bid teams, with whom we are united by our common love of the Games. After Boston, other cities withdrew from the process. Have you not feared a protest movement in your city ? Los Angeles is a city that lives and breathes the Olympic and Paralympic Games. Angelenos were fully behind our bid for the 2024 Games, and last week a new poll released by Loyola Marymount University showed that 83% of residents support hosting the Games in 2028. In a few words, how could you define the decisive role of the actors in the bid over the past few months: for example, IOC US members Eric Garcetti, Janet Evans, Gene Sykes, Terrence Burns, Jeff Millman, And yourself of course ? Since day one, one of our team’s greatest strengths has been our united passion and desire to see the Games return to the United States. We have built a talented and experienced team and we have learned a lot from the past American bids. While Monday’s announcement was a major step towards bringing the Games back to LA, there is still work to do as we approach Lima, Peru on September 13 and then beyond to 2028. My focus, along with the focus of the USOC, is entirely on LA’s bid for the Summer Games.